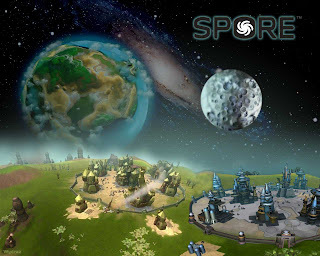 Home / copyright protection / DRM / Spore / The spore, the merrier? "The DRM on this thing is less friendly than my recent colonoscopy - you get three installs. That's it. No install returned for uninstallation, or anything else". Myriads of complaints have been posted on Spore fan sites and gaming websites, as well as on Electronic Arts' official discussion forum. Electronic Arts' FAQ section prefers to put a more positive slant on things: "
Games are authorised to your machine when you first install and launch the game. This system allows you to authenticate your game on three computers with the purchase of one disc. EA Customer Service is on hand to supply any additional authorisations that are warranted. This will be done on a case-by-case basis by contacting Customer Support." Says the IPKat, would it not be ironical if it should come to pass that the copy-protection system for a game that lets cells evolve into civilised humans is itself subjected to a process of evolution that enables it to be installed on rather more occasions? Merpel adds, what's the betting that someone will post a comment to say that it's not irony but something else, and you've got the wrong word again? As I understand it, EA's breezy assurances about "three computers" are misleading. Changing the hardware on your computer - e.g. buying a new graphics card - magically transforms your PC into a "new" computer, requiring a further authorisation. Pirate versions of Spore are already freely available (in both senses) with this DRM restriction removed. I think the real irony is that people normally happy to pay for a legitimate copy are likely to end up using illegal copies solely as a result of the DRM used. I can certainly envisage people who own a legitimate copy installing pirate versions in a few years' time when they've used up their 3 installs and don't want the hassle of pleading for a new activation from EA. Right on, Anon! So rarely is it appreciated that too much security is extremely insecure (U-shaped curve). If you have to change the password weekly to a new 20-digit sequence containing both figures and letters, what happens? People make the system useable by writing the current password on a yellow Post-It note and sticking it on the screen.